This is another one of those "Ouch!" covers that simultaneously sticks it to the you-know-who's on Wall Street while evoking a real sadness for what has happened to the U.S. and the world as a result of the financial meltdown. 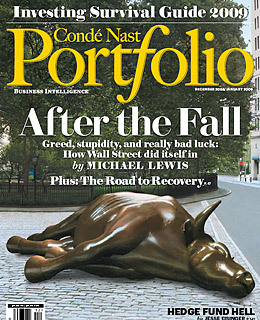 Here we see the power of iconography, the fallen Wall Street bull  long a symbol of dominance, growth, optimism and American power. The statue's execution (pun intended) achieves what any image maker or cover art director aspires to do, i.e. make another professional (or reader) look at it and wonder, "How did they do that?" The likely answer is 3-D rendering, deftly done and inserted into the photo via Photoshop. If this had been a drawing or painting, it would have none of the conceptual power and visual resonance of this image. A quibble: too much type. Imagine how much stronger this would have been with few or no cover lines.